Welcome to Day #4 of Chocolate and Colombia Theme Week. This Limited Edition single origin bar came with quite a bit of information (via Gerard's Notes, printed on the back of the attractive gold packaging) about its origin. For example, "Arauca is a department of Colombia shaped by the Casanare and Meta rivers and located in the extreme north of the Orinoco region, bordering Venezuela." Beans from Trinitario hybrid cacao, that apparently have maintained some fine flavor, heritage Criollo cacao characteristics, were used to make the bar. 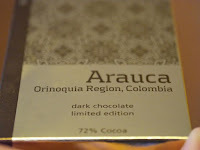 The chocolate was interesting and flavorful, with a honey-like sweetness; that is, it had a sweeter (almost nutty) flavor than I associated with many 72% dark chocolate bars. I got a quick hit of red fruit/berry flavor, followed by a pause, then a slight earthy note at the end. 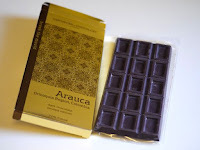 *The common practice is to ship fermented, dried cacao beans from the growing country to chocolate makers in the Northern Hemisphere, who make the chocolate bars (involving many steps, such as conching, refining and tempering of chocolate) in their factory. 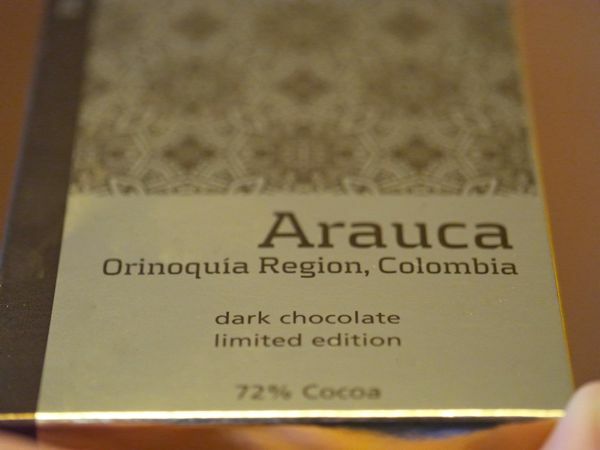 This bar was produced in Bogota, Colombia, by Casa Luker (a family-owned Colombian company). It was nice to see this alliance and credit given to work being done in the country of origin.